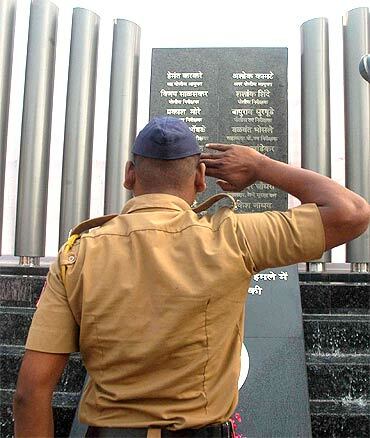 Union Home Minister P Chidambaram on Friday paid homage to those killed in the 26/11 terror attacks by laying a wreath at the martyrs' memorial at south Mumbai's police gymkhana. 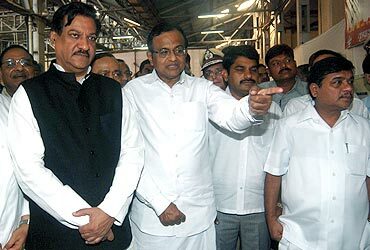 Besides Chidambaram, Maharashtra Chief Minister Prithviraj Chavan, Deputy Chief Minister Ajit Pawar and Maharashtra Home Minister R R Patil were among those who paid homage to the 166 people killed during the carnage. 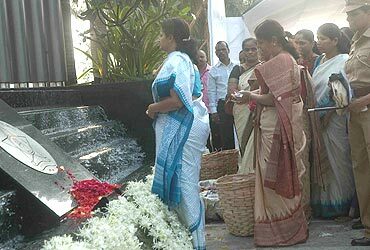 The family members of many of those killed also attended the programme, including the widows of the 26/11 martyrs. Chidambaram and others observed a minute's silence in their memory. The home minister also interacted with the family members of the martyrs and enquired about their wellbeing before he went on to review the advanced security weapons and vehicles procured by the city police. 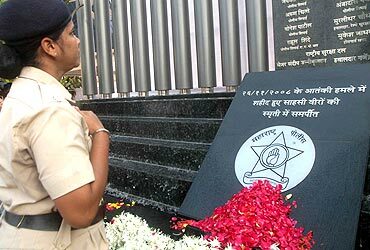 Earlier in the day the home minister inaugurated a CNG filling station allocated by Mahanagar Gas to the family of martyr cop Tukaram Omble, who perished while apprehending Pakistani terrorist Ajmal Kasab on the night November 26, 2008. He also met the family members of 26/11 martyrs, including the wives of top cops Smita Salaskar and Kavita Karkare, and heard their grievances. After paying tribute, Mumbai Congress President Kripashankar Singh, said, "We have written a letter to the home ministry stating that Kasab be hanged at the earliest." 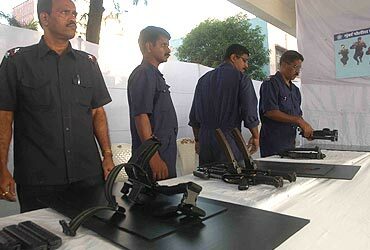 To mark the second anniversary of the attacks, the Maharashtra police took out a parade in south Mumbai beginning from Oberoi Trident Hotel, one of the sites of the deadly strikes. The parade, which saw the participation of teams of Force One, Quick Response Teams and the Mumbai police, began after saluting Maharashtra Chief Minister Prithviraj Chavan. The parade displayed advanced anti-terror combat vehicles and weapons procured by the state police following the terror attack. 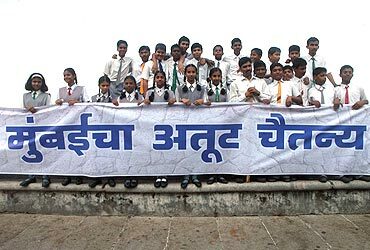 A 1.3-km long banner, which read 'The Great Wall of Mumbai', was held by hundreds of Mumbai students, starting from hotel Trident, one of the sites that was attacked by terrorists on November 26, 2008. Deputy Chief Minister Ajit Pawar, Maharashtra Home Minister R R Patil and state Minority Affairs Minister Arif Naseem Khan, Director General of Police D Sivanandan, Mumbai Commissioner of Police Sanjeev Dayal were among those present.